I am pro-choice with respect to suicide. This position is a difficult one to hold in the society in which suicidal thoughts are often considered as conclusive evidence that one is “mentally ill” and must therefore be subject to massive “therapeutic” coercion. It is nonetheless a position with an ancient and respectable pedigree. As recently as within my lifetime a group of luminaries was willing to sign onto suicide as a fundamental civil right in the Humanist Manifesto II. To enhance freedom and dignity the individual must experience a full range of civil liberties in all societies. This includes freedom of speech and the press, political democracy, the legal right of opposition to governmental policies, fair judicial process, religious liberty, freedom of association, and artistic, scientific, and cultural freedom. It also includes a recognition of an individual’s right to die with dignity, euthanasia, and the right to suicide. The ability to end one’s own life is the one unbreachable firewall against suffering and indignity, and it is the path to the one refuge from tyranny where no secret policeman can ever follow. Small wonder the Manifesto signers were willing to group it right up there with freedom of speech and association. I maintain that in any genuinely civilized society the best available means of suicide (probably something like the protocol used by the assisted-dying organization Dignitas) would be available to any non-delusional adult who could articulate a clear wish to die. So, Faustus. you clearly don’t think there’s anything morally wrong with suicide. (Indeed, as you are a moral skeptic, it’s not clear you think there’s anything morally wrong with anything, but that is a discussion for another day.) You seem to be in a rather tricky position. You’re a hedonist pessimistic about the balance of pleasure and pain in your own future. You have elaborated an analysis of why the social world is so structured that you are unlikely ever to find happiness through love, and whether or not this analysis is correct, you personally seem unlikely to ever find much love, given your self-admittedly lousy personality. You also think you won’t find much satisfaction through work, either. As for the rest of your life, you seem to think that the balance of it will consist of an accelerating decline into misery. At the same time you appear to endorse an Epicurean notion of death as “the most peaceful sleep I will ever have.” That would appear to mark the end of a period of suffering that you see as inevitable in life. Something almost positively good, compared with the alternative. So why don’t you just kill yourself? I regard that as a good question. Here is my answer. It has two rational bits and one irrational component. Irrational component: Homo sum. As a human being I am subject to the same psychology that affects all other human beings. Nature has wired us to fear and avoid death, even when life is largely miserable (natural selection is not our friend!). The Epicurean view of death, while correct, is a culture innovation layered on top of a vastly older psychology. The fear of death, even if dead wrong, is very hard to overcome. It’s like one of those visual illusions that, even when you know for certain that it is an illusion, does not go away, because our inner wiring is simply not made to deal with it. Source here. 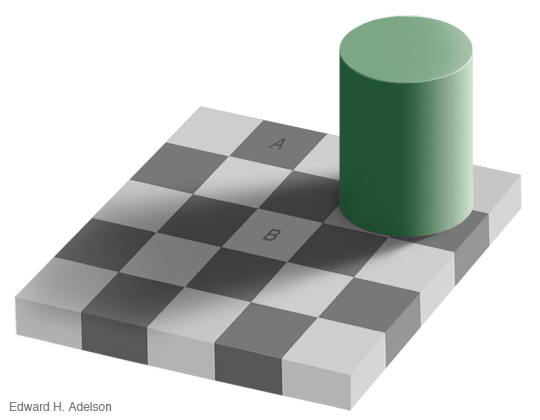 The shade of gray at points A and B is the same. But it sure doesn’t look the same, and it never will look the same, no matter how many times you cut the image apart to compare the squares side-by-side to confirm that it is, in fact, the same. We’re stuck with this illusion, just as we’re stuck with fear at the prospect of our own non-existence. We are vehicles in the service of replicators which determine our design, and it doesn’t serve the interests of that in virtue of which designed us vehicles to be crashing. Whether this is in the interest of the vehicles is of no concern to the replicators. Is this irrational? Yes. We’re stuck with it. It means that it’s hard to commit suicide. Moving on. Suicide isn’t as easy as it might appear. As commentators like Sister Y have often pointed out, the best methods for committing suicide involve drugs that most people can’t easily or legally obtain — the fast-acting barbiturates in the Dignitas protocol, for example, are Schedule II controlled substances in the U.S., so good luck getting your hands on any. Other methods have a distressing tendency to fail. They fail because, well, human beings are imperfect at executing their plans and, perhaps more so, because our intrinsic fear of death makes it difficult for us to push forward and carry through on such plans as we might make. The knife at the throat quivers; the gun is mis-aimed, the knot in the noose is badly tied. And if they fail, what they’re likely to result in is (1) your finding yourself with some gross damage or debility as a result of your attempt and (2) your being delivered into an ugly institution of social coercion, the “mental health” system in which you will be subject to deprivation of liberty, forcible restraint and forcible medication. (Because anyone who dissents from consensus, “life is wonderful” values isn’t just someone who disagrees, but someone so depraved in intellect as to be unworthy of either liberty or dignity until ve is “cured.”) No thanks to all that. Not wanting to cause suffering in others. Perhaps more importantly, I do care about not causing suffering to others, or at least, to some others. And I know full well — from the experience of having friends who have committed suicide — that it does cause suffering to those left behind. That’s a terrible thing. It might be less terrible if we lived in a society more genuinely sympathetic toward suffering individuals and thus more accommodating toward people who want out of it. But we don’t. Our culture is poisoned with ideas like “life is always worth living” (and still more hideous and incomprehensible, the notion that “suffering is a gift from God.”) My lousy personality notwithstanding, I have acquired loved ones in this life, and the thought of the suffering that my possible suicide would cause them has been a deterrent thereto, even during my Dark Times. Especially then, actually. And so here I am, existing. One thing I intend to do while I continue existing will be the subject of a near-future post. December 16, 2012 Iago Faustus, Ph.D. The only thing preventing me from offing myself is Dirty Trick #1. Everything else is secondary. To the best of my admittedly very limited and error-prone ability to tell, you seem to be afflicted by very little optimism bias.